Powerflo is the first line of defense when dealing with initial blockage issues. Its small and compact size makes it easy to carry to problem locations for instant drain opening. Before using snakes and cameras, Powerflo can usually remove the most common blockages quickly and cost effectively. 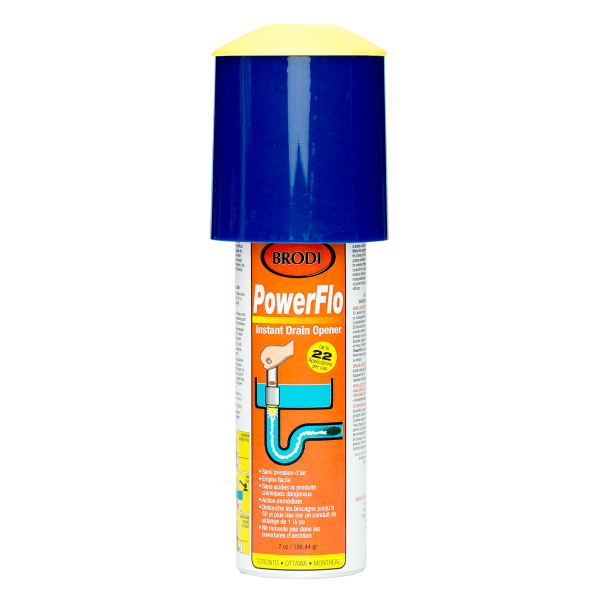 Powerflo is designed for commercial use and contains a propellant formula that when released in water, expands rapidly, creating a standing wave. Using the water in the pipe as a hydraulic ram, Powerflo pushes the blockage through. No air pressure or chemical is actually used to accomplish this. Powerflo will not shoot up vent pipes and focusing only on the blockage. Contains approximately 22 applications per can making it the most cost-effective drain solution. With no harsh chemicals, acids, CFCs, or lye, Powerflo is safe for the environment. Water is needed for Powerflo to operate effectively. The grey plastic cap must be submerged below water or water must be added separately to it. 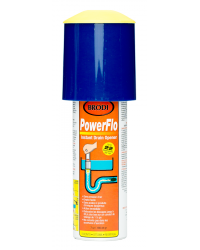 If there is standing water in the blocked fixture do not remove it, block overflow vents or opposite sink with a damp rag, place the Powerflo can and applicable components of the 3 part kit, upside down over the drain opening and press firmly for one second. Note: Hold the can for a few seconds for slow moving drains. Powerflo is capable of unblocking drains up to: 50' down a 1-1/2" diameter drain, 45' down a 2" diameter drain, 35' down a 2-1/2" diameter drain, 25' down a 4" diameter drain, 18' down a 5" diameter drain, 12' down a 6" diameter drain. Will not contaminate the ground water.